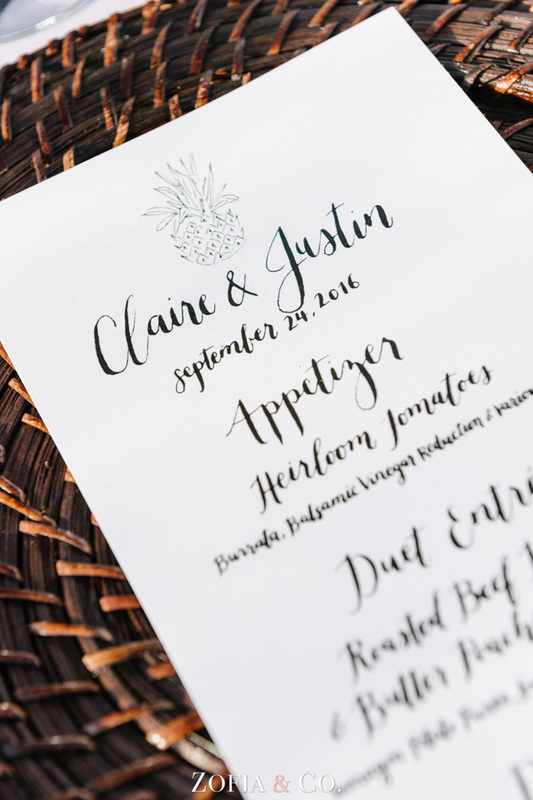 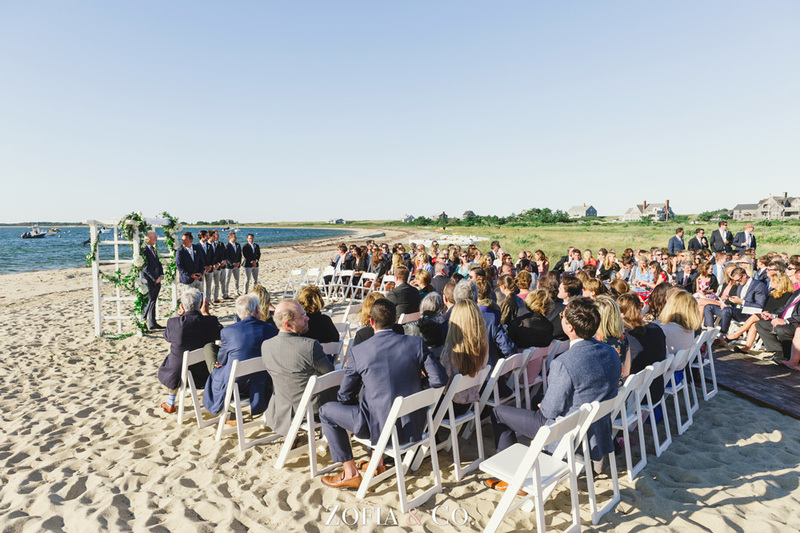 Justin proposed to Claire in Jamaica, but instead of bringing their guests to Jamaica, they decided to bring the island vibes to Nantucket. 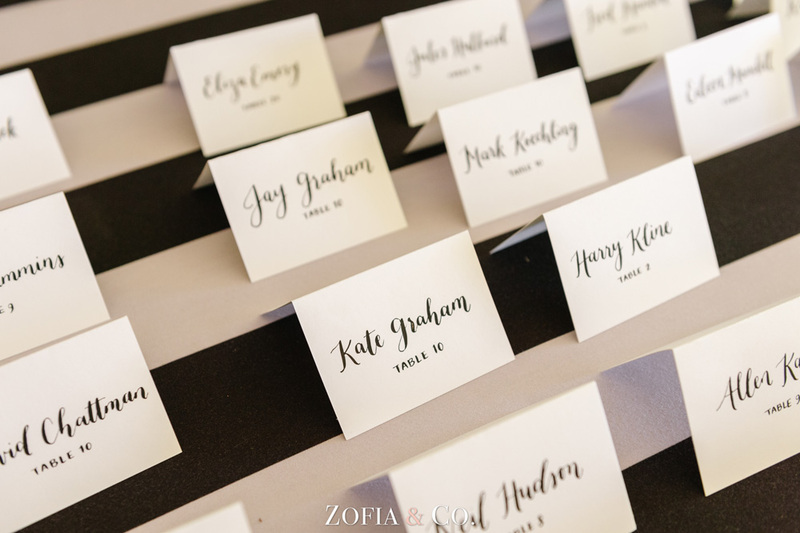 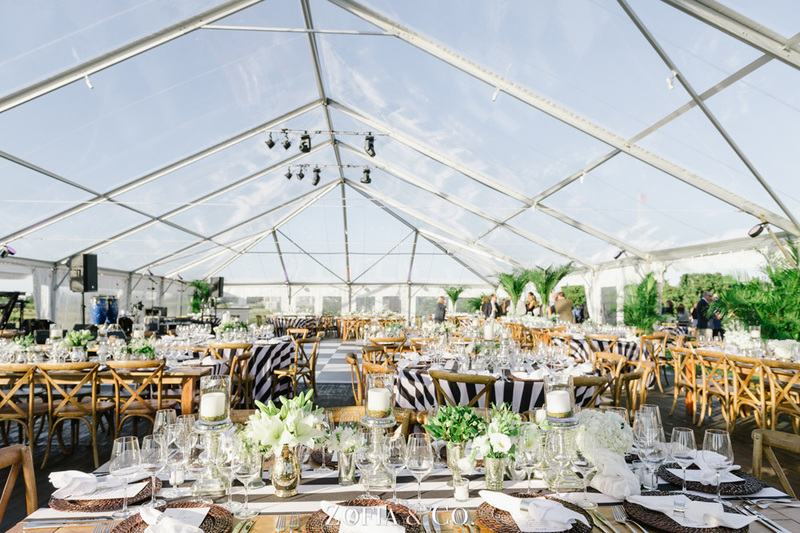 The couple searched for a venue able to accommodate 220 guests as well as an after-party on-site. 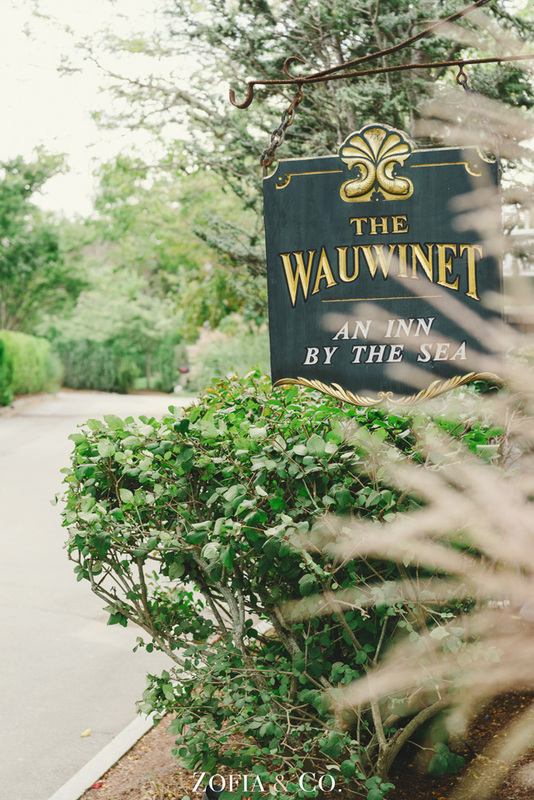 The Wauwinet met both requirements, and so the planning began. 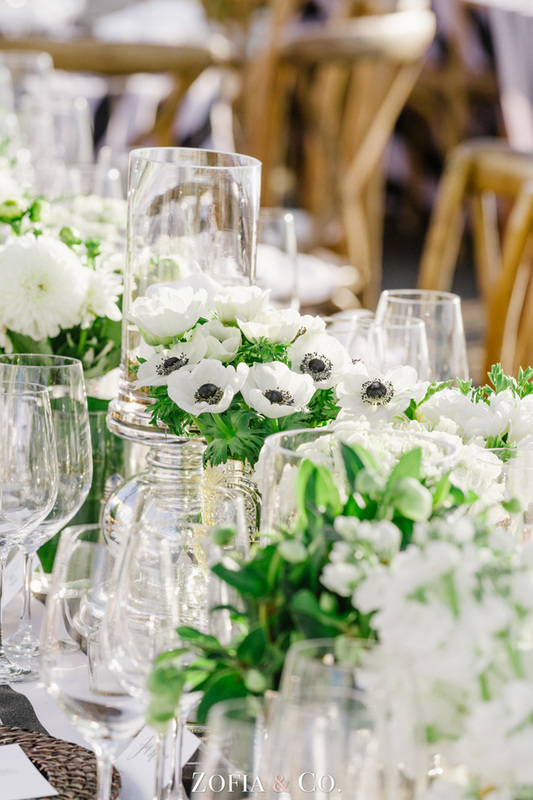 “I could not speak more highly of the team at The Wauwinet – they made everything perfect that day, and leading up to it!” Claire raved. 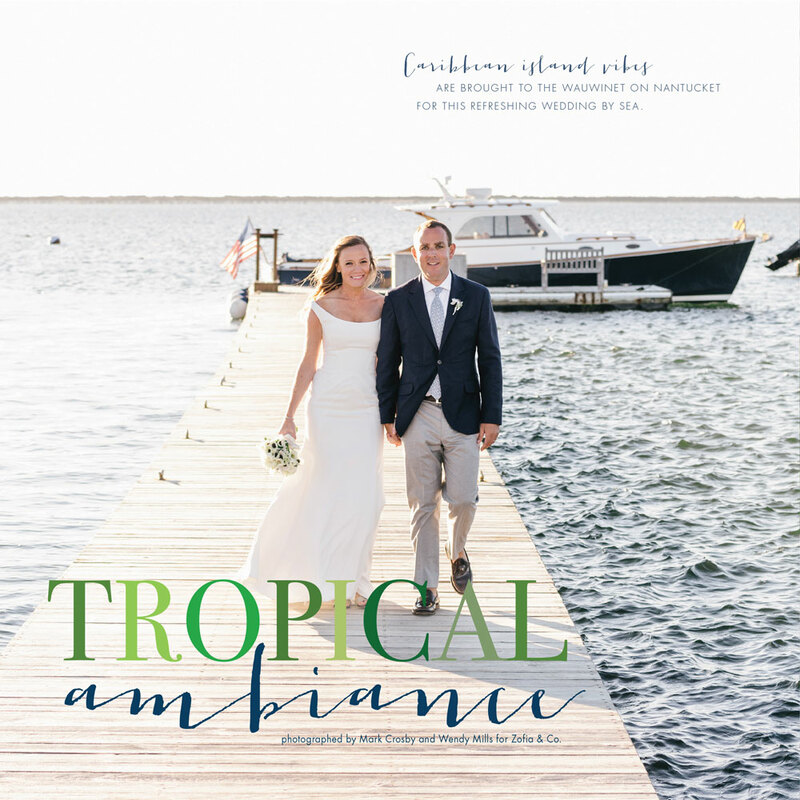 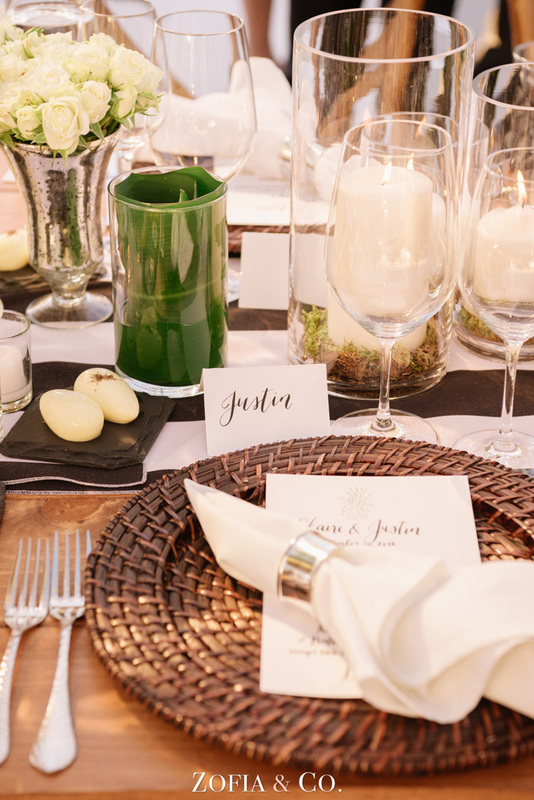 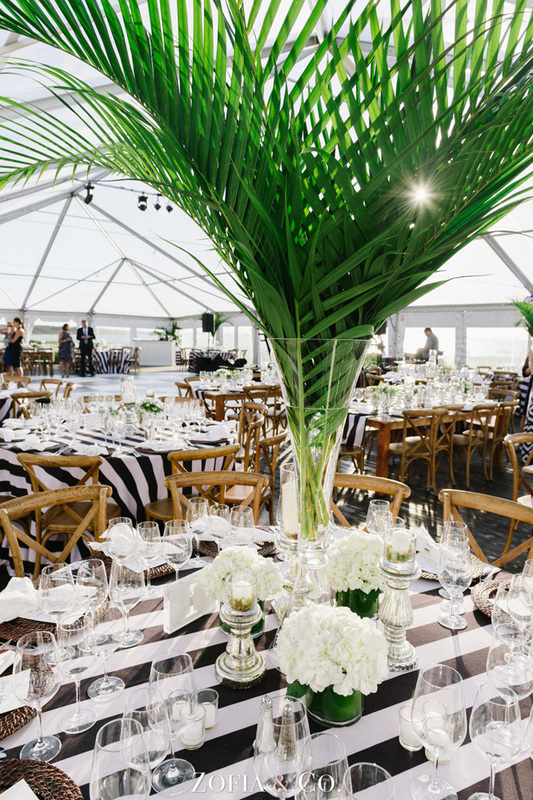 They decided on clean, tropical-inspired décor with a touch of Ralph Lauren air. 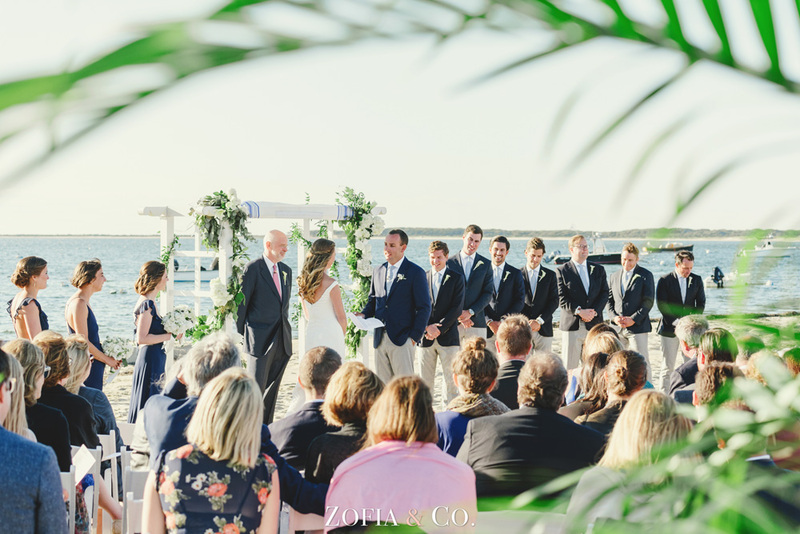 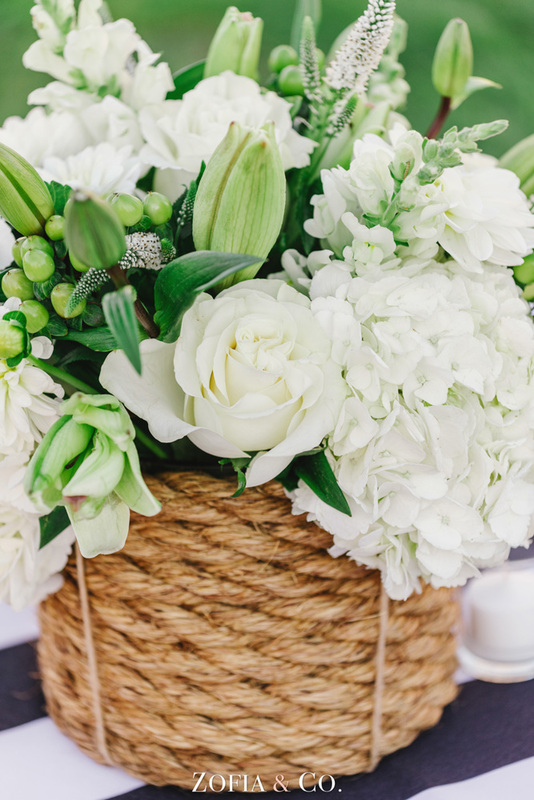 The ceremony took place overlooking the ocean, beneath a white trellis that was decorated with bright white owers and greens. 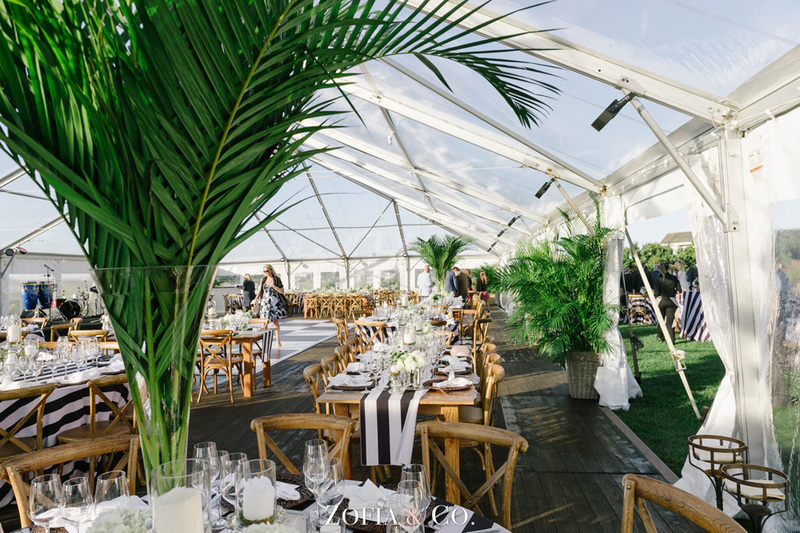 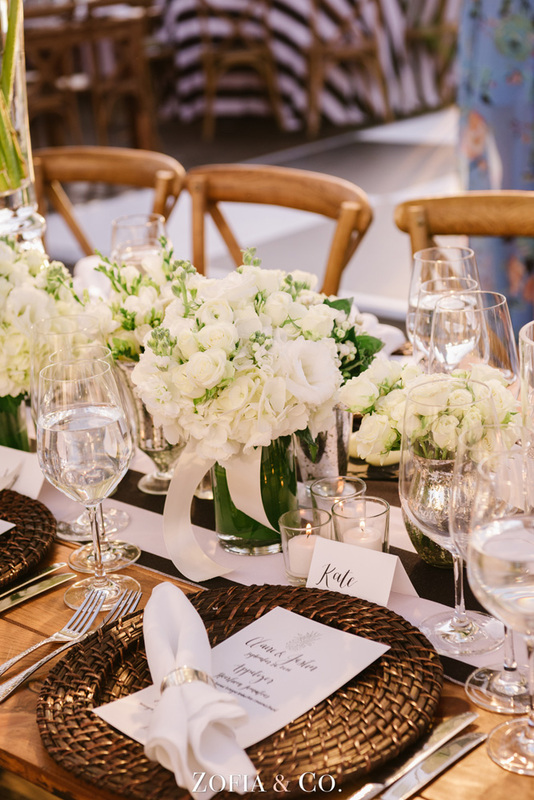 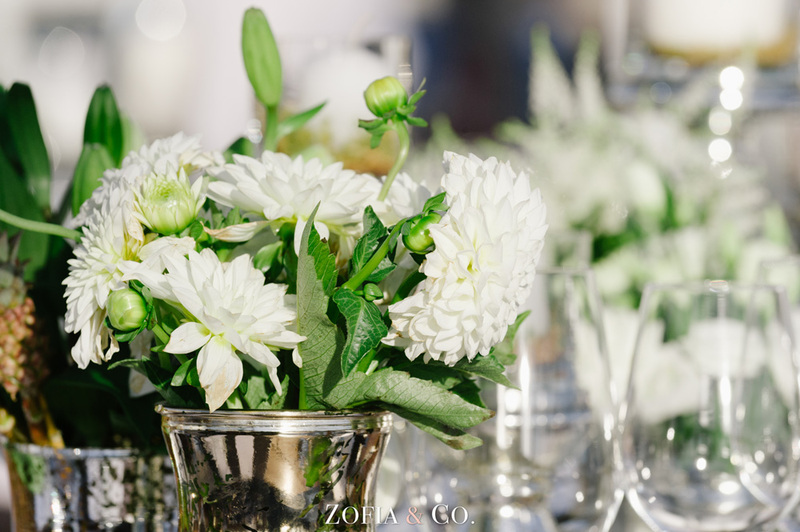 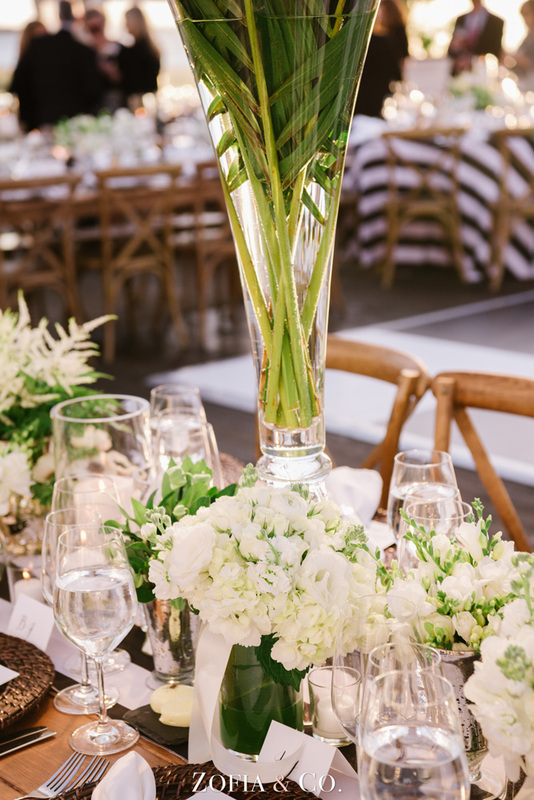 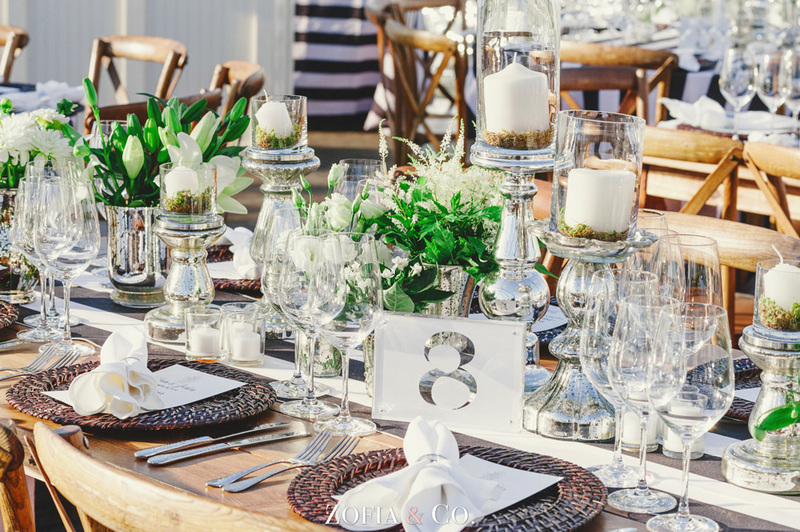 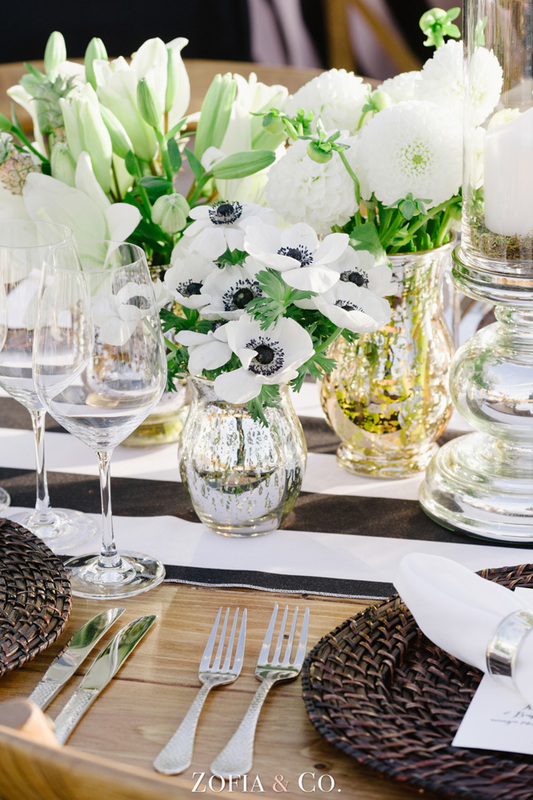 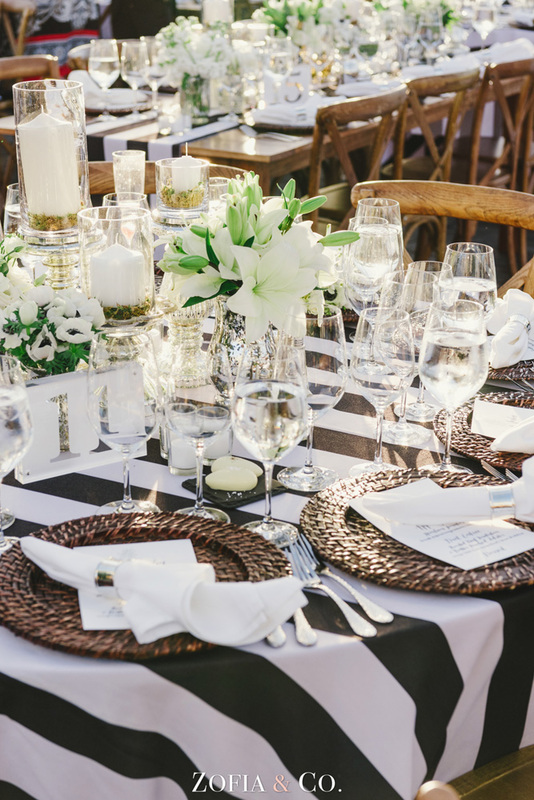 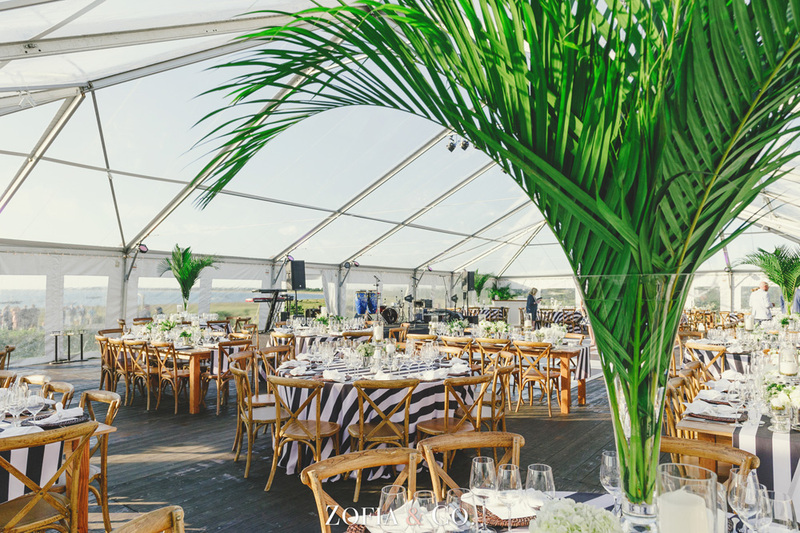 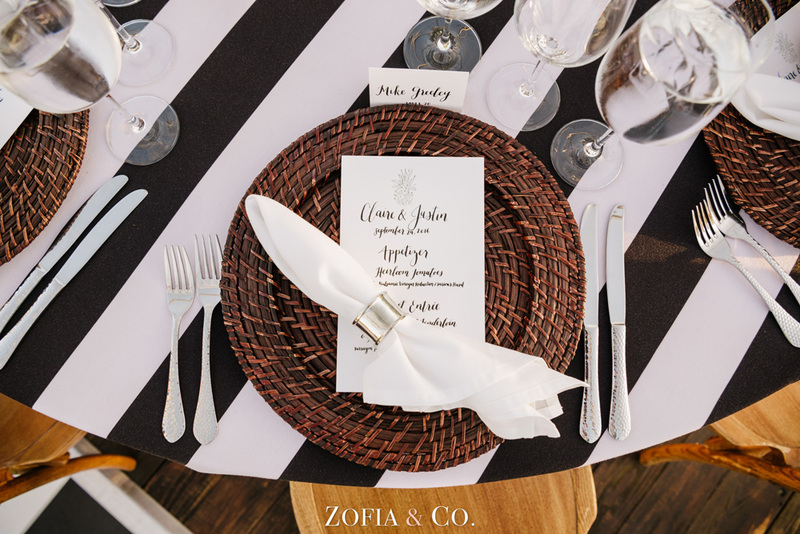 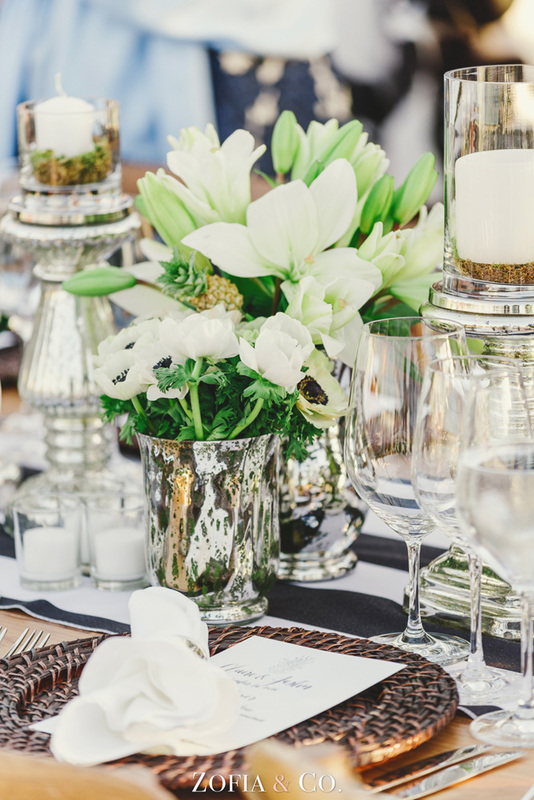 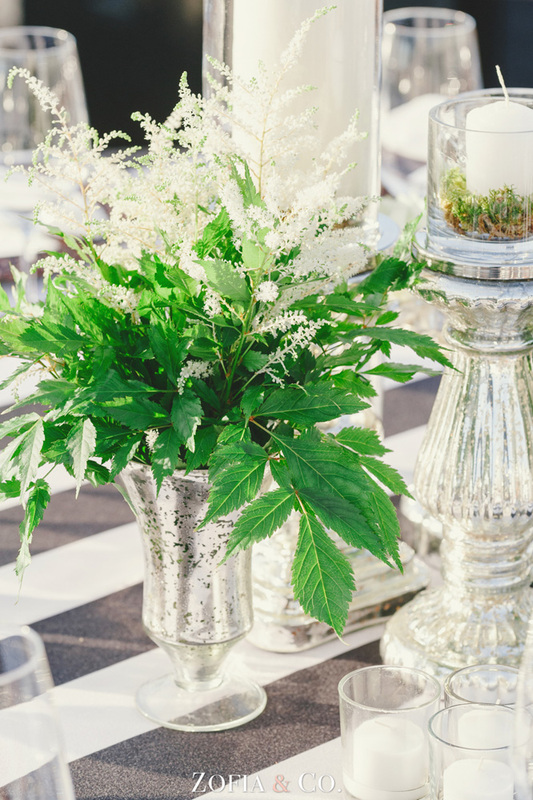 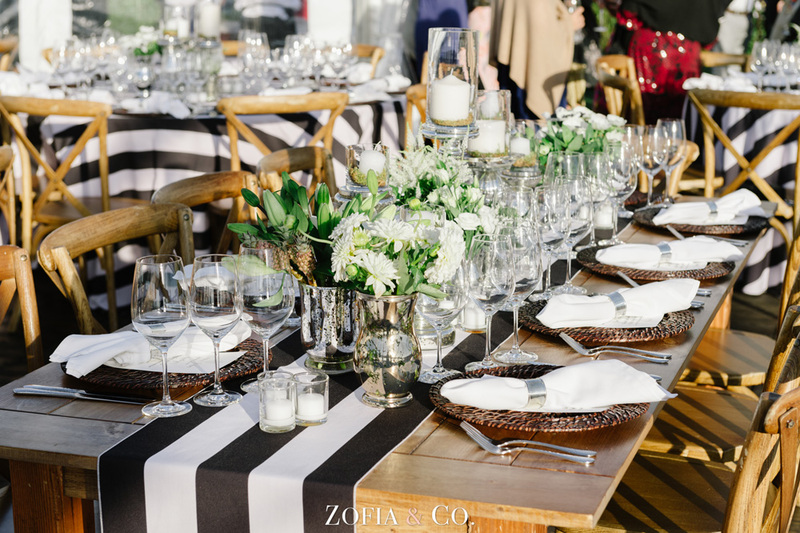 Inside the tent, long wooden tables were lined with crystal vases that were bursting with fresh palm fronds. 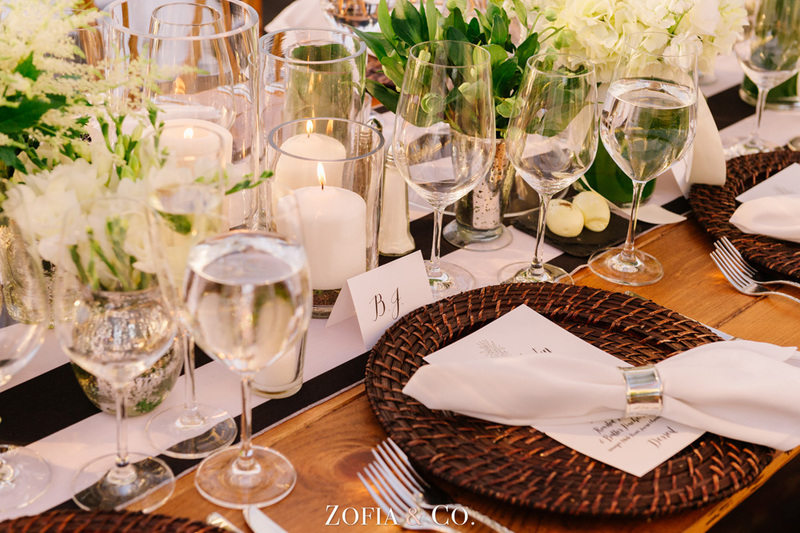 Smaller white and green oral arrangements surrounded by oating candles warmed the table. 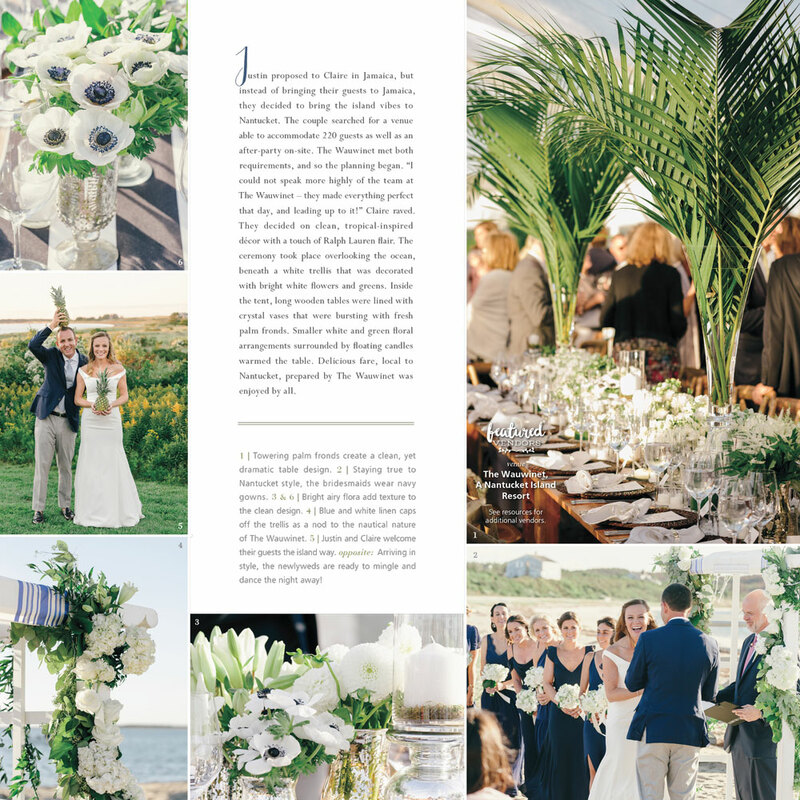 Delicious fare, local to Nantucket, prepared by The Wauwinet was enjoyed by all. 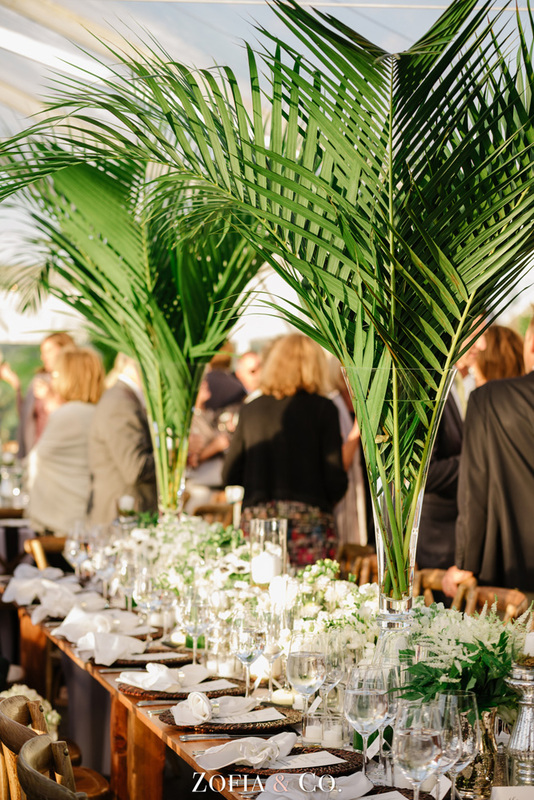 1 | Towering palm fronds create a clean, yet dramatic table design. 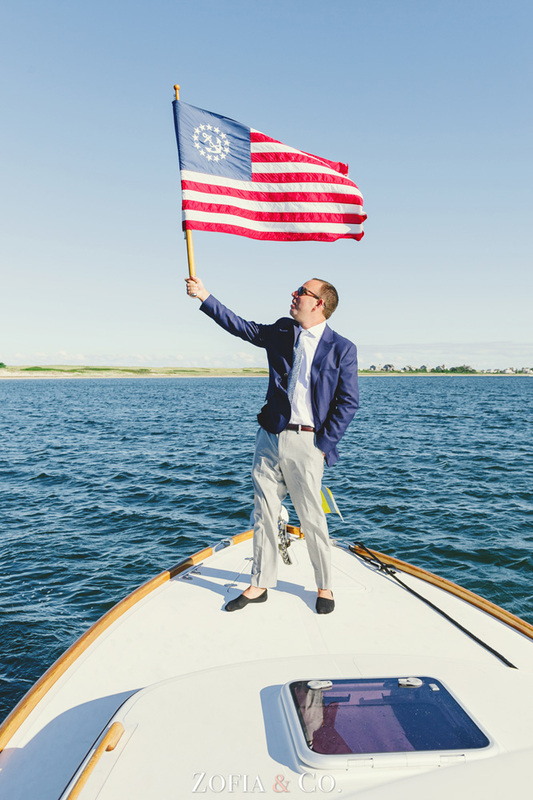 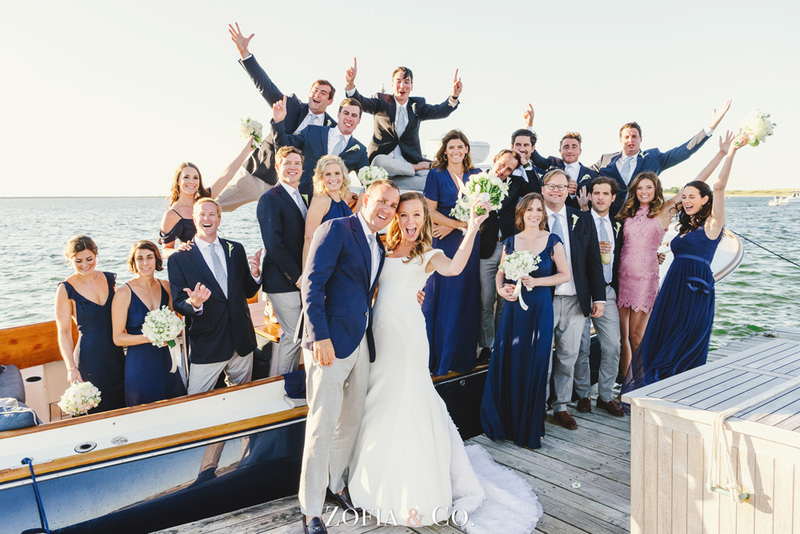 2 | Staying true to Nantucket style, the bridesmaids wear navy gowns. 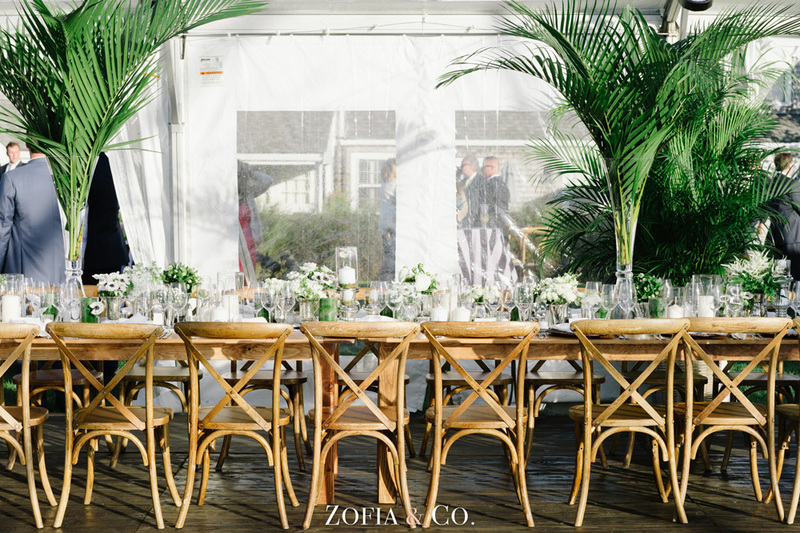 3 & 6 | Bright airy ora add texture to the clean design. 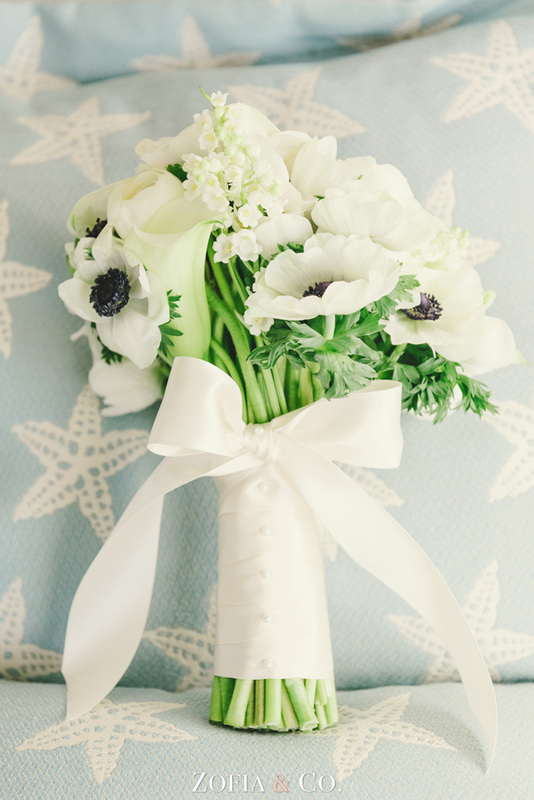 4 | Blue and white linen caps off the trellis as a nod to the nautical nature of The Wauwinet. 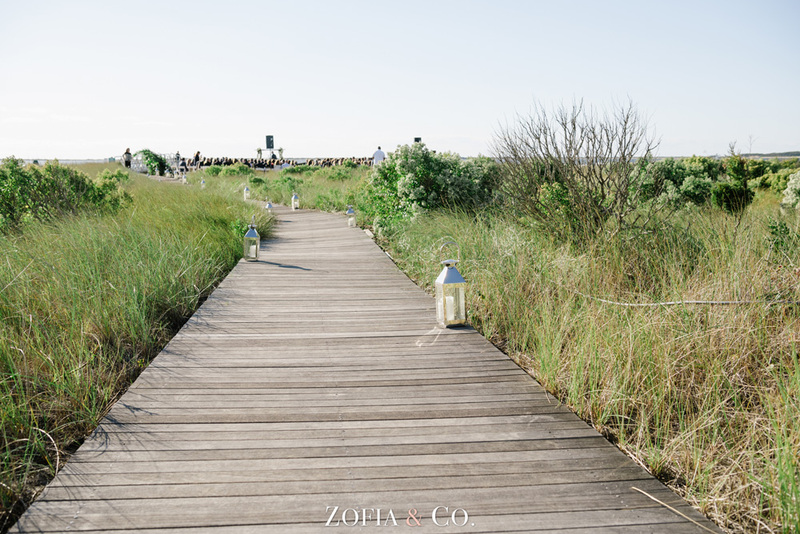 5 | Justin and Claire welcome their guests the island way. 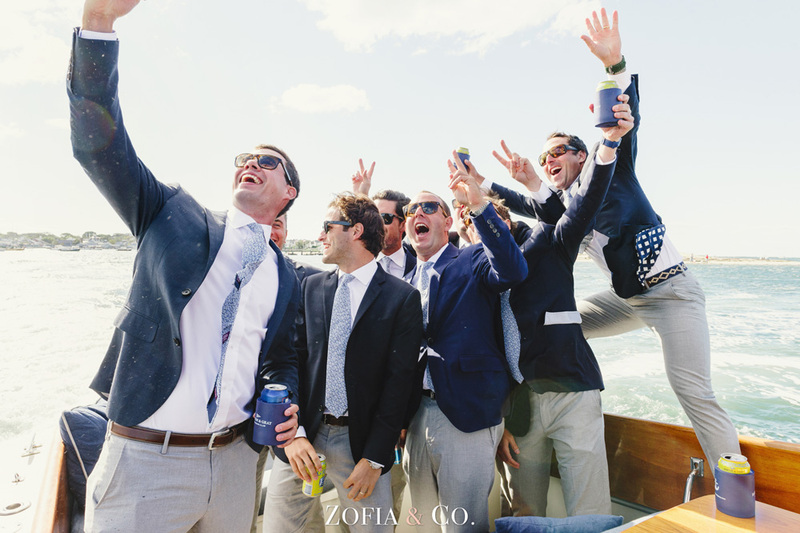 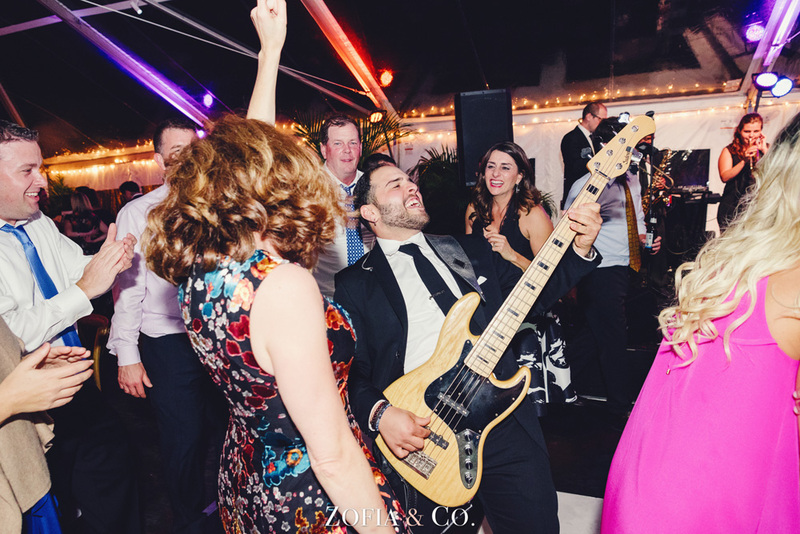 opposite: Arriving in style, the newlyweds are ready to mingle and dance the night away!